Is Your Web Hosting Company on Twitter? These Ones Are! 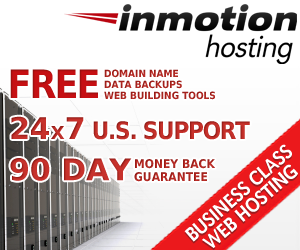 Home » Hosting » Is Your Web Hosting Company on Twitter? These Ones Are! Whether you’re happy with your existing hosting company or you’re looking for a new host, it’s a good idea to choose one where employees communicate effectively with customers. One way some hosting companies are interacting with customers these days is through Twitter. Hosts use Twitter in a variety of ways, some of which might be important to you and others that might not. Let’s take a look at how hosts are using this social media tool, a list of hosts actively using their Twitter accounts (as of the time this article was written), and how you might get better customer support using Twitter yourself. Here are three ways some Web hosting companies are using Twitter to offer value to customers like you. Support representatives monitor Twitter and respond to questions and complaints customers post about their services. The hosting company posts updates during downtime — like maintenance schedules and updates or details about ongoing recovery efforts when they’re experiencing problems. The idea is to keep you informed without every customer having to individually call or email them. You can get updates on Twitter in real time instead. They post special offers, coupon codes, or announce other deals for current customers or those looking to sign up for a new hosting package. This can be especially useful if you’re planning to leave your current host or you’re looking for service renewal specials. Here are 20 examples of Web hosting companies you can find with an active Twitter presence. On numerous occasions, I’ve received better support from hosts on Twitter than I did through other means. That’s because no one wants to see negative information about their company posted to someone’s network. It hurts their reputation. That’s not to say you should complain just to complain. But if you have a serious problem and the host’s support people aren’t proving very useful, take it to Twitter. Briefly post about the problem, and make sure you include an @reply to the company account so they see your tweet. You might even include your ticket number if you have one. Not every hosting company using Twitter monitors the account for support requests. And some hire social media people who have no real authority to deal with your support concerns. But at the very least, they can forward your information to the best person to address the problem. Will it always work to complain about your host on Twitter? No. But in my experience, they do tend to reach out. In situations where the host does not, I’ve connected with other customers having similar issues, allowing us to compare notes that have helped to resolve widespread issues when we can reach support reps through other means. 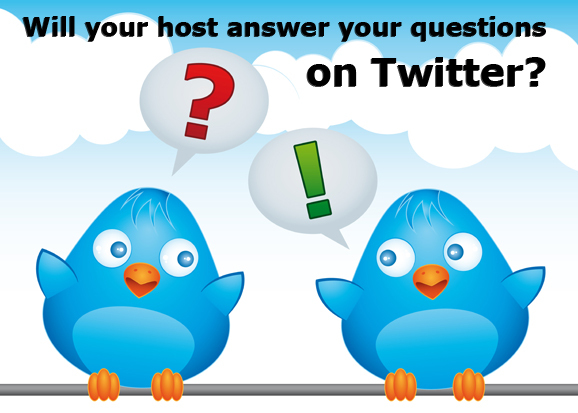 Is your host on Twitter? How do they use their account, and how would you like them to use their account if you would prefer they do so differently? 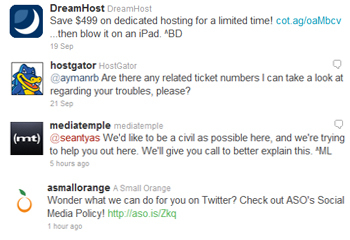 Have you ever used Twitter to get better customer support from a Web hosting company? Tell us how you did it in the comments below. Pingback: HostGator Best Coupon Code Top 100 Web Hosting | Web Hosting – HTML, CSS, PHP, ASP.net, Ruby, RoR, Perl, Python, and More!